The animated mainstay will officially reach and surpass 500 episodes. This morning, Fox officially picked up The Simpsons for renewal, thereby ensuring the show's run through 2012. During season 23, the show will mark its 500th episode; this puts the series just behind Lassie (588 episodes) and Gunsmoke (635 episodes) for the most episodes ever produced for primetime television. The decision was not solely in the hands of the Fox Broadcasting Corporation; Gracie Films (James L. Brooks' production company) also had to agree to the renewal. 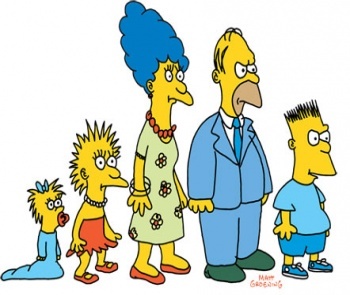 According to The Hollywood Reporter, executive producer Al Jean was pleased with the prospect of a twenty-third season, saying "like many 22-year-olds, The Simpsons is extremely happy remaining at home, on Fox, and hopes it doesn't have to go out into the real world for many years to come." Many (myself included) think that the series has stretched far past its prime, but today's announcement suggests that the denizens of 742 Evergreen Terrace are still reaching a sizable audience. After all, as Troy McClure reminded us in "The Simpsons 138th Episode Spectacular," "The Simpsons have come a long way since an old drunk made humans out of his rabbit characters to pay off his gambling debts. Who knows what adventures they'll have between now and the time the show becomes unprofitable?"